Pure music for acoustic guitar, solo or with overdubbs, romantic lyricism or avant-garde compositions. Old european polyphony, spanish tradition and concepts of free-jazz and classic music of the 20th century. 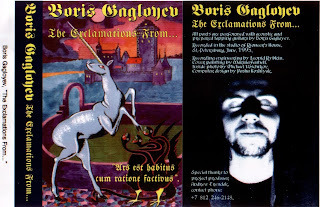 One of a few early records of russian guitarist and composer Boris Gagloev (1969 Vologda - 2008 Prague). Released on tape in St.Petersburg in 1995, in 2004 was digitally remastered from original DAT tapes. Reissue on SFA with the consent of Marina Gagloeva.